Below is a list and description of the items you will receive when you rent a Canon video camera from the ITS Help Desk. If any of these items are missing, please contact the Help Desk at x3333 or helpdesk@etown.edu. A camera bag with carrying straps that contains the other items listed. Generally heavily padded but not waterproof. One (1) Canon video camera suitable for capturing video. Each video camera is labeled with an ID number, for example in the image below, the camera is labeled 1957.One (1) SD card is included in the camera (not pictured). Picture taking, although available as a feature on this device, is not recommended for quality photographs. If you would like to take photographs, consider renting one of ITS' digital cameras. The Canon video cameras available for rent do not require AA or AAA batteries. They do, however, require a charger shown in the two images below. The charger must be plugged into the wall and the camera to charge before use (not required during use). If you would like to review your captured video on a TV or similar display, an AV (RCA) cord is included. This cord can be plugged into the camera and a display in order to view the video and audio you have recorded. A cord required in order to upload your videos. 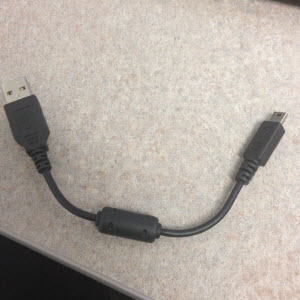 This cord is plugged into the camera and your computer to ensure access to recorded files.